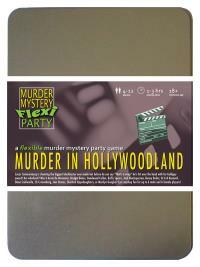 You've been invited to play the role of BRIDGET BONES in Murder in Hollywoodland. You're invited to a star-studded yacht party, as Lucas Cameronburg is shooting the biggest blockbuster ever made! But before he can say "That's a wrap! ", he's hit over the head with his Goldguy award and pushed overboard! Join us to find out who cut Cameronburg from his own film! Thick rimmed glasses, white coat and a voice recorder are the tools of your profession. You soften the serious scientist look with a flouncy skirt (caught in your Granny-pants of course) and a pastel sweater to cover your more than ample bosom. Hold ups and inappropriate shoes complete the look. You have two main traits - 1: an IQ that would shame Einstein and 2: an inability to do anything without falling over, embarrassing yourself or getting your skirt caught in your knickers. At 13, you graduated from Oxford University with a Masters in Anthropology and ever since you have been responsible for identifying no fewer than 10 separate ancient civilisations that were previously unheard of. Despite your career success, you have a disastrous track record with men, who always seem to bring out the ditzy, socially awkward teenager in you. Hello! I’m Bridget Bones - you may have read my online diary. I’m a world-renowned anthropologist – AND I study bones. I’m superior to all of you in intelligence, genetic makeup and bone structure, yet for some stupid reason I’m embarrassingly clumsy and have the worst luck with men. For the record, I was with Lucas Cameronburg until exactly 2 a.m. last night. I know because when I looked at my watch it was caught on my skirt and I ended up showing Lucas what he’d been trying to see all night!